Yesterday morning, I attended a Press Breakfast for the Living with Nature Exhibition in London. 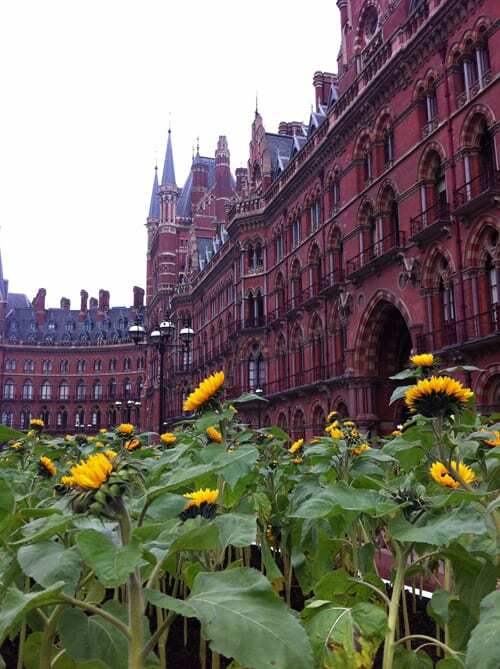 It’s an exhibition to celebrate horticulture and art within an urban environment and is set in the St Pancras Renaissance Hotel & St Pancras International. Ian Drummond, who is the Creative Director of Indoor Garden Design, is the very talented gentleman behind the installations. And in sequence, they take you through his life, with each piece either featuring flowers or plants. Growing up in a council estate near King’s Cross, Ian developed an interest in gardening at the age of seven/eight years old. His family home didn’t have a garden. It was in his aunt’s garden that his passion for horticulture was nurtured and grew. And this was especially the case when his aunt’s health began to decline and he took responsibility for looking after her garden…which came with a shed. This shed is represented by the ‘My escape’ installation below. And it’s my favourite piece from the exhibition, even though it doesn’t contain flowers! It’s a very unassuming plain white box, lined with mirrors and filled with 180 Vriesea plants. The only way to view the inside of the shed is through peep-holes. Ian wanted to create a fantasy, magical feel and he’s certainly captured it with his choice of plants and lighting. I personally was overwhelmed by the vibrant, almost neon colour and couldn’t stop taking another look. It was so lovely to see the reaction of members of the public too, when they peered inside the shed. ‘Slowly turning’ is the name of the beautiful installation outside. It’s the first image in today’s blog post and the one on the left hand side below. It consists of a field of over 800 sunflower plants. The slow turning of the sunflowers represents Ian’s decision to fully commit to horticultural and floral design. He studied floristry and then later garden design at Capel Manor College. Apparently, since the exhibition opened on Tuesday, the sunflower field has been the most successful installation in terms of engaging with the public. And I can certainly see why. For me, it felt like a little piece of nature had been transported to the hubbub of central London. ‘Nature meets us’ is an installation of a smaller field of sunflowers at the base of the Meeting Place Statue. Below is ‘Growing out of the box’. This installation celebrates Ian’s 25 years in horticulture and floral design. 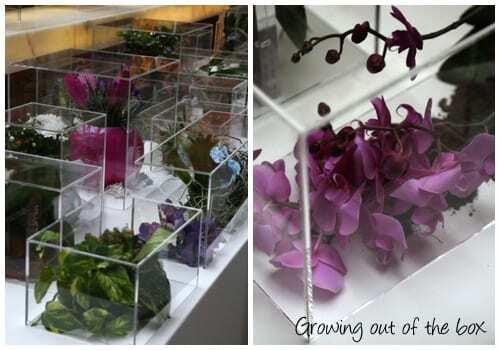 It features 25 perspex boxes, each showcasing a significant plant used by Ian throughout his career. High points include his Silver Gilt Medal at the RHS Chelsea Flower Show 2010 and creating designs for the BAFTAs. Some boxes also include fabric from fashion brand Gyunel, whose work has been a source of inspiration for Ian. If you’re in London over the next week and happen to be near St Pancras or King’s Cross, I highly recommend seeing the Living with Nature Exhibition. 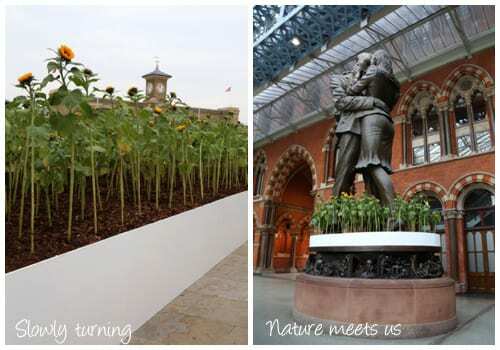 You’ll find the installations on the upper and lower levels of St Pancras International. And they’ll be in situ until Thursday, 10th October. What a perfect way to bring nature into an urban setting and I’m sure the exhibition will brighten up the lives of many of the 14,000 daily visitors to the station. P.S. The hashtag on Twitter is #livingwithnatureshow.